What do you look for in a stage? Discussion in 'Richard Burns Rally' started by Rick Bamford, Oct 26, 2010. There have been a few comments in the Racedepartment Rally Championship threads regarding the Perrogney stage (RSRBR2010-BTB tracks 5) used in the Third round and the road textures. As someone that plays with track building a little it started me thinking. What is it that poeple look for in a stage to make it a good one? Comments like "reminded me of rally games some 10 years back" and "poor quality of surface texture - like old VGA games" just confuse me as i think this is one of the BEST stages i have seen for RBR, not including the issue with the trees. When creators focus on graphics levels and texture mapping we end up with games like WRC2010 which i think we will all agree is TERRIBLE. For me, the important thing is the way the car drives on the road (and off it ) The gutters, the placment of trees and objects, snow banks and the way the terrain matches the road. I actually find the original USA stages in the game as the most unrealistic with the exception of prospect ridge. The length and flow of a stage are the most important thing. It is always good the have the chance of changing weather, time of day etc but that is not so important, as long as there was a variety of conditions across stages. The "LOOK" of the stage isn't very important to me. If a game was released today that had the graphics quality of Colin McRae Rally 1 and had stages 15-30 kms long but was more realistic in physics, damage model and setup adjustment than RBR I would call it the best game EVER. So what is it that YOU, the drivers that play and love RBR like me, WANT to see in a stage? What is important to you? Maybe this thread will be ignored, or maybe it can provide so information to track builders as to what we ALL want to see. I just want smooth transitions between different road surfaces, and the area around the road, ditches and stuff. I'll address the Perrogney: I think the stage looks GREAT (my first thoughts were "Man, this is REALLY great, especially for a BTB stage! "); maybe the issues were caused by low graphic settings/non-native resolution? As I said, I found the whole stage to be very pleasant to look at. But this particular stage had a few major drawbacks - first, and possible the worst, wsas lack of collision model with trees. I'd rather that every tree stopped the car in it's tracks than be completely drive-throughable (word-making!). First time I drove down the stage I was amazed and really happy, because it seemed very narrow (a bit like Sardininan roads from WRC round), which would make for a real challange; I was very disappointed when my car flew through a ginormous tree without any problems. This is a BIG issue, since to be fast you have to drive in a different way that trees suggest, sometimes even clipping a few. Bad, bad, bad. That brings me to another major con - not enough grip level changes. It was possibly caused by non-collidable trees, but you could just plow through the grass, with minor impact on the speed and grip. It wasn't easy to make shortcuts, but I was thrown off the rhythm by this fact every time it manifested itself. Road surface itself felt quite good, very grippy (could be just a tad more slippery, but that's a matter of maker preference if it's a fantasy road), but not perfect - it was flat as a table, sadly author didn't try to throw an occasional bump/destroyed surface here and there. There were couple of places which just begged to send a jolt through the car, but it was just for show. What I WANT to see in the stage? + If it's possible - variety. I'd absolutely love to see stages like Arena Panzerplatte from Rallye Deutschland with it's non-solid road surface, concrete plates, Hinkelsteins and many elevation changes. + Length. Possibly one of the most important things. Most of the real stages START at lengths where gaming/sim stages end. I'm not a fan of memorizing stages, just remembering a few key places is enough. 50km stages, anyone? I'm in. Graphics don't need to be mindblowing. They just need to be solid. I'd kill for the conversion of all CMR2/3/4/5 stages conversion into RBR. There were some seriously FANTASTIC tracks in there. As an author of one of quotes You wrote I'm obliged to post. 1. Perognay has really nice layout - combination of straights turns is really nice, also the length of SS is real. 2. No trackside objects collisions make it unrealistic. 3. Pace notes surprised me twice with "Key left" right after "caution" on the 5th gear straight leaving no chance for braking. - layout which should be called close to reality. - look of houses barriers etc. Just as Rick I want to feel like as I will drive a rally driver in RBR and not like watching rally in TV with some influence on the direction car is driving like in WRC2010, but my feelings for Perognay is that is WIP and not final version of the track, with good layout but some graphics detail still to do. Glad you saw the quote was from you . Some good feed back so far and i agree with almost ALL of it. Nice to know i'm not alone. One very important thing I would love ANY track builder reading this to see. Even in a replay poeple aren't looking at the houses, fences and barriers. they are watching the cars. It doesn't matter if they are a white box with NO detail. I have spent time talking to a few track builder and they seam obsessed with detail of things only track builder look at. Don't get me wrong, they are SOOOO talented with the work that they do, ALL of them. Just think how many stages we could have if they spent their time building great drivers stages instead of work of art. The only reason I build stages is to drive them. Lukasz, what about the stages from WRC 2/3/4? Some great ones in them aswell. I liked the stage, it really reminded me of the narrow roads and long stages in Mobil One Rally Championship (I think thats the game I am thinking of). The trees absolutely need to be collidable, and I would have loved to hear the branches of the trees scraping the car in the narrow spots. as one of the other quoted guys (we Blue Flaggers seem to be a quoteworthy lot ...) I need to chime in, too. 1 change change change: any player wants to have a stage that surprises him even after a dozen runs. 2 ruts and holes and loose sand on tarmac and whatever: anything to make the track feel like offroad through the ffb not like a slightly rough racetrack (and this is really where RBR is unbeatable as is Rally Trophy and where DIRT at times a is a great game, too, but all other rally games I have played fail miserably) At Perogny I failed to notice a single dent in the track, possibly because it must be fiendishly difficult to create those. I dabbled a bit in 3d modelling for architecture and think I have at least an inkling of what true 3D modelling implies. 3 atmosphere: and contrary to the others posting here and from my position as an arts teacher who also has a background in aesthetics and design I am convinced that for atmosphere it's the small things that count. Think of Lord of the Rings without the Hobbits`penchant for colourful clothing or without Sam's love for his pots and pans. Half of the joy would be gone. So if a designer invests time in putting dirty sneakers on the feet of the guy who gives you the starting signal, I guess he's right. What was great for instance in McRae 2005 was the way leaves would fall off a tree if you knocked it or the flowers you could see stem by stem in the undergrowth of the British stages. To use another analogy from storytelling: If a guy designs a stage without these extras it's like reading a plot-outline of a novel. If a guy puts them in, it's like reading the novel. Notice how you reread a truly well done novel while you would never reread a manual as concise as it may be. 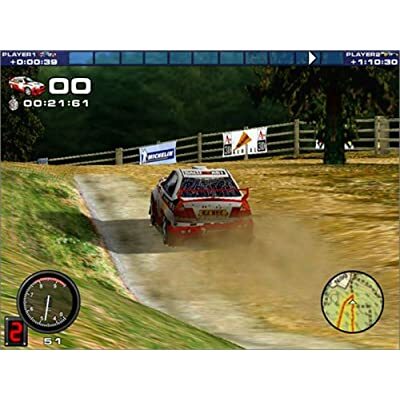 4 length: I used to play a game called Rally Championship 2000 http://ecx.images-amazon.com/images/I/51XEHFWZZ0L._SS400_.jpg which truthfully recreated rally stages in Britain and Northern Ireland. There even was a real life map with an indicator showing your position on the screen. I really enjoyed that, just getting through these stages with your ride intact was a challenge. We are all in our hearts of hearts little boys who yearn to be real racedrivers and if a game gives us the impression that we just might be, so much the better. One of the reasons why a superb racing game with only made up tracks and cars (Live For Speed) has quietly folded even though the netcode is (to my mind) unbeaten. In case the guy who created Perogny reads this: I admire your patience and skill in building this stage, it must have either cost a marriage or the better part of a year, kudos! Yup! Looks like it was released with different names around the world. I think that was my first real racing simulation, I just remember it being really hard and DNFing constantly. Yes, the same game was mentioned 3 times, each time under different name . I'd love to see stages from it too. That's why I have great hopes for Gran Turismo 5 - rally stages here are said to be generated, so you should not have to drive just a few over and over again and you'll need help of the co-driver to get through them. Hmmmmmmmmmmmmm, Interesting. but i disagree with you completely. This is going back to a point I made earlier about designers thinking stages are artwork. I have just written a long post SLAMMING your post but decided that it is not my place to do that, lol. Maybe we can argue the point in private. Somehow I missed this thread, dunno how. Good topic though. I had mixed feelings about Perrogney. I thought it looked quite good, the narrow roadway was different to others which was a plus, giving it a bit of atmosphere that others tracks don't necessarily have. It was fast and flowing, with it's main difficulty being the undulations, especially just before some tight turns. The length was ok too. What let it down badly was the unrealistic drive through scenery objects, completely lost the realism fear factor. I suspect the fast guys just barrelled along flat out, knowing there was no danger even if they went off track. Lots of practice here could pay huge dividends I think. I drove it assuming the trees were real, paying them full respect, and was shocked to find myself more than a minute off the fast guys (I know I'm slower in general, but not THAT slow). The pacenotes were dodgy too, but that is always a gamble with BTB tracks. As for what I look for in a track, well, Lukasz and Eckhart pretty much covered my views. In summary, I want realism in terms of track feel, danger, and atmosphere (Noiker was a classic example of how it should be done). I also want variety, in terms of length, track surface, and variety of fast sweeping turns mixed with tight twisty bits (Noiker again). Variety of bumps, fords, potholes, etc too ( another good example is Harwood Forest). To me the quality of graphics is fine in default RBR tracks, they look realistic enough to me when I have my eyes glued to the road ahead, and still look ok in the replays. Maybe it's me, but I find the so called modern graphics of new games like WRC 2010 to be totally unrealistic (over coloured, cartoony, un natural). If we had more default quality Stages, preferably based on more real world Stages, I'd be as happy as a pig in mud. If only the physics engine were better, lol. Just yesterday I borrowed from someone, a video card and try one run on Tervaniemi,:bang:, super stage!!! That's the kind of stage that I want to run on a rally and I said it all. This stage will be the reason that I'll be making an hole in my wallet and go to grab a new video card ! And that Slovak Stage is not so bad also Mlynky on tarmac. The down side of Perrogney from my point of view ( for what I know a bad point of view , because of my video card) is the unrealistic surroundings, myself I "hit" many trees in Round 3 of Champ, but not intended. For sure I'd like more new stages, because just like in rallyes, you don't have to learn by hart all of them. That sure is an impressive looking Stage, where did you find it? I'm afraid I agree with Eckhart. Of course the actual road itself is priority but to create a real 'feel' of driving an event rather than driving some road, the devil is in the details.